would someone know about the hardiness of Ambrosina bassii? level to may be 100m high. 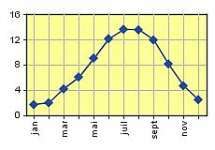 Please find in attachment the curve of the month mean minimum temperatures. year. All were gone the following year. >Zone 7 I will try when I have some more plants. >I think it grows offsets, dosen't it?